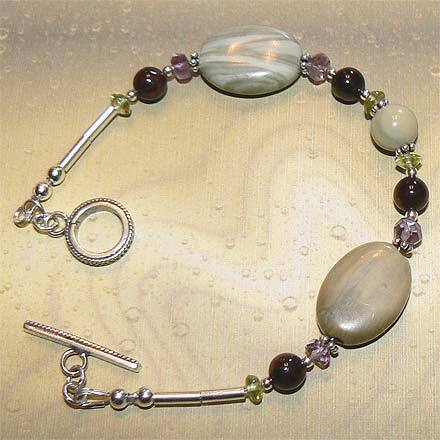 Sterling Silver Jasper, Garnet, Amethyst and Peridot Bracelet. A blizzard of sand and tumbleweed across the great plains, evocative of old photos of the dusbowl landscapes...that's what this Jasper stone reminds me of. Necklace comes with a Garnet clasp. For those who are interested in Astrological significances of stones, Jasper corresponds with Virgo and Leo, Amethyst corresponds with Pisces and the month of February; Garnet corresponds with Capricorn and Aquarius and the month of January, and Peridot corresponds with Libra and with the month of August.